If you have not seen the memorials throughout Washington DC lit up at night, this is the cruise for you. 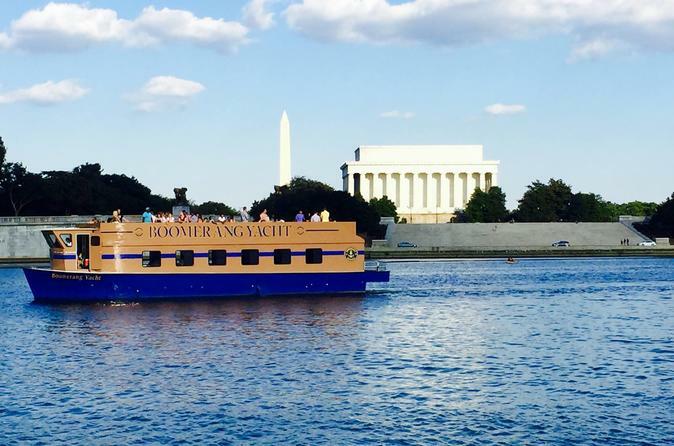 This party yacht travels along the Potomac River in the evening so you are able to witness the reflections from the river and the glow from the moon, while enjoying music spinning from the DJ on board. Have you ever experienced the memorials light up at night? The reflections from the river and the glow from the moon set the tone for a beautiful, fun night traveling along the Potomac River on a decked out party yacht. The party yacht which you will be spending your evening on for just over two hours comes fully equipped with a cash and credit card bar full of unique beverage creations. On board are three bathrooms, a dance floor in the main cabin, and stunning views of the DC skyline throughout the vessel. Whether you are a seasoned cruiser or if this is your first time experiencing the party yacht, you are sure to have an excellent time and a night to remember.